If you own a business, the annual audit can sometimes feel like a time-consuming and costly process that only benefits the legal authorities. We make sure all your tedious reporting requirements are met as effortlessly as possible - banks, creditors, finance providers, and even the Inland Revenue, no reason to complain. But more than that - we aim to offer you the kind of business advice that could help you to run your company in a manner that is not only well-organized, but also cost-effective. We also offer expert corporate tax planning advice and, to make sure you are as tax-efficient as possible. We focus on ensuring adherence to strong internal control systems to diminish the risk of accidental or deliberate errors and exceptions, safeguarding of assets, sufficient division of authority over key control areas and compliance with internal operating policies are other focus areas of our procedures. Efficiency and competence of management are key determinants of any organization's success. Our measures aim to maximize management performance by focusing on improving processes within the organization. Our goal is to guarantee that resources of the organization are optimized to deliver maximum possible value. We concentrate on streamlining processes, curtailing waste and objective measurement of management and staff performance. Despite designing and instating high quality control systems, organizations do face situations involving scam and financial impropriety. We have assisted clients in detecting such situations and taking counteractive measures. We help our clients in conducting financial, legal and accounting reviews in case of mergers, acquisitions and investments. A clear understanding of local laws, regulations and accounting practices enables us to scrutinize all vital issues in detail. Precision and accuracy are essential in evaluating and managing cost and accounting data. Our assistance in developing and installing these systems eases the decision making process of the management. 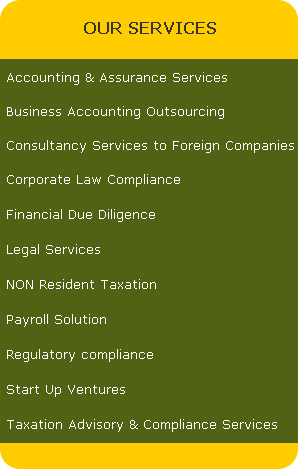 We assist clients in compilation of financial accounts per accepted accounting standards which help companies to compete effectively and efficiently in global market.